The Amalgamated Association of Street, Electrical Railway and Motor Coach Employees of America was established in 1893. Division 101 received its charter for related workers in the Vancouver area in 1899. In 1901 Division 134 was established in New Westminster and given its charter. Divisions 101 and 134 were amalgamated in 1968 and from this date, correspondence and other records have been maintained in the files of Division 101. The Independent Canadian Transit Union successfully raided this division of ATU and currently represents city bus drivers in Vancouver and Victoria. The ATU continues to represent the Motor Coach drivers of Vancouver and Victoria. The fonds includes minutes of regular meetings (1898-1976), executive committee minutes (1907-1974), membership and dues ledgers (1901-1966), records books [working conditions affecting members of Division 134] (1931-1947), and Sick Benefit Association (1913-1919, 1950-1954). 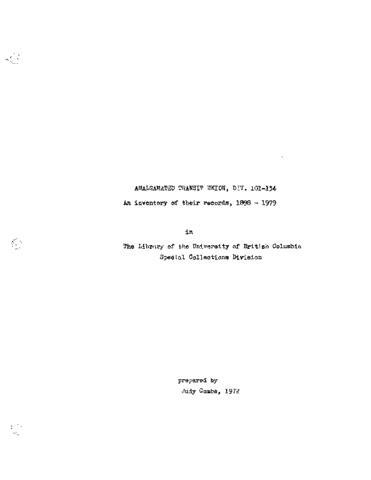 The fonds also contains office subject files such as general correspondence (1908-1970), correspondence with B.C. Hydro and Power Authority (1962), meeting attendance records (1957-1961), political education committee records (1957-1961), and minute books, correspondence and attendance books relating to Pacific Stage Lines (1935-1979).